I always thought Australia's Unitopia offered a certain sense of comfortableness. With their third album, Artificial, and as on previous works, the band delivers traditional melodic progressive rock, certainly from the classic English side of things from the 70's forward. Yet listening to Artificial I hear a universal theme within from America's Ambrosia to Poland's Satellite to Scandi Flower Kings to most any quintessential English progsters, including Mr. Floyd. This work is creative, but mostly soothing and delightful. Artificial could be a soundtrack for a breezy afternoon cocktail or wine and cheese party in the late Summer. (This is probably from the inclusion of Peter Raidel's airy saxophone contributions on many pieces.) This feeling may put some off, especially those who wish their prog to be excessively provocative from the start. Yet, in the midst of familiarity and expectation, Unitopia delivers prime melodic prog on Not Human Anymore, Gone in the Blink of an Eye, and the masterful Tesla, the best track on the entire album. Frankly, it's all good, if you like your progressive music on the consistently melodic side with dashes of rock, jazz, and fusion. As I said, Unitopia's Artificial is a delightful and pleasing listen. Quite recommended! 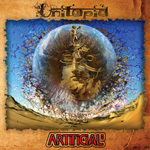 Unitopia's Artificial is all good, if you like your progressive music on the consistently melodic side with dashes of rock, jazz, and fusion. It's a delightful and pleasing listen.